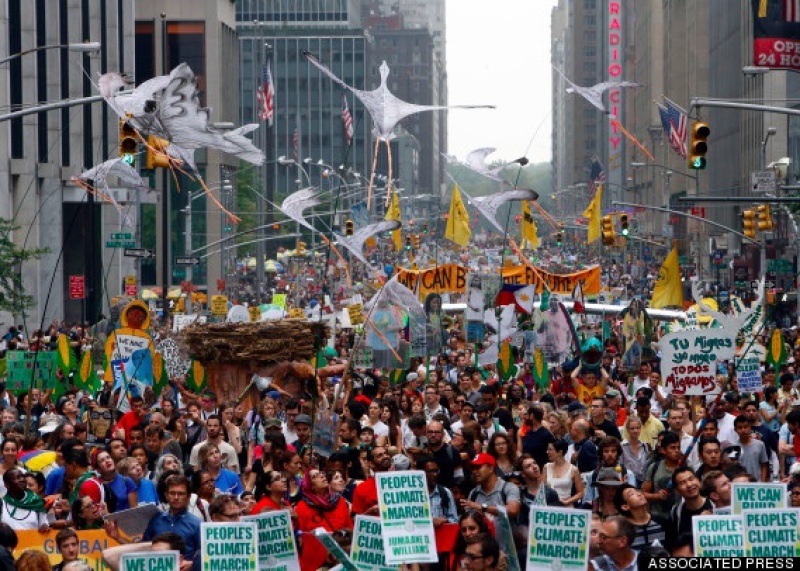 More than 400,000 people turned out for the People's Climate March in New York City on Sunday [September 21], just days before many of the world's leaders are expected to debate environmental action at the United Nations climate summit. The White House has pledged to "show the world that the U.S. is leading on climate change, and to call on other leaders to step up to the plate," John Podesta, who serves as a counselor to the president, told reporters on Thursday. However, a recent study found that the world spewed more carbon dioxide into the atmosphere last year than ever before, primarily driven by China, India and the United States. And the top leaders of China and India announced earlier this month that they won't be attending Tuesday's summit. The march began around 11:30 a.m., at New York City's Columbus Circle just off Central Park. 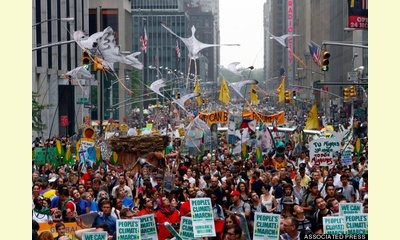 At times, it stretched more than 4 miles as marchers carried banners, signs and entire contraptions depicting everything from Mother Earth herself to the dinosaurs that now make up fossil fuels. "Today I march because I want to behold a brighter future. We have destroyed ourselves. We have destroyed our health and I'm here because our political leaders have failed us," Stanley Sturgill, a retired coal miner from Kentucky now suffering from black lung, said at a press conference before the march. "We know together we can build our bright future." "We need to act now ... We only have one atmosphere and we of the Marshall Islands only have one land to call 'home,'" Kathy Jetnil- Kijiner, a young mother from the island nation, said before the march. "We don't want to move and we shouldn't have to move."